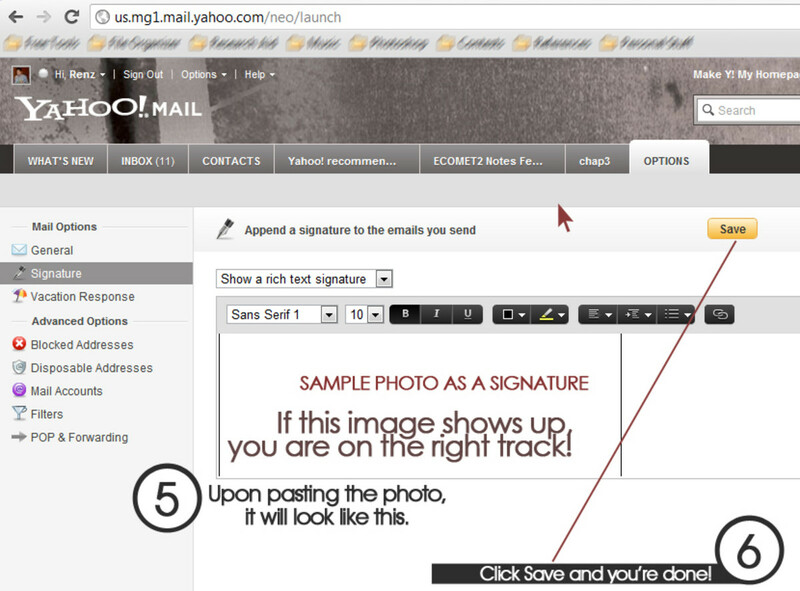 Image Signature in Your Yahoo Mail, Amazing! 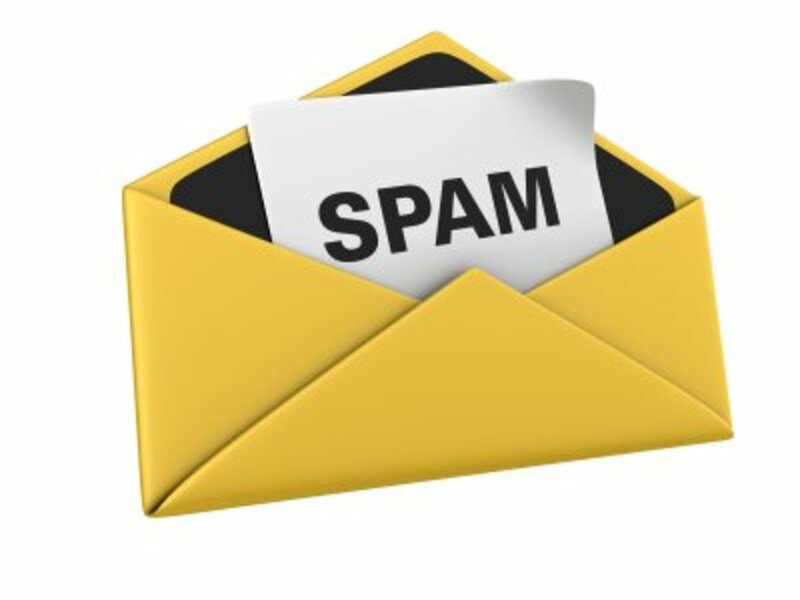 If you are a frequent user of Yahoo Mail and want to increase the professional look of your emails (or perhaps you just want to add some dash of fun and creativity in your emails), then you have stumbled upon the right article. 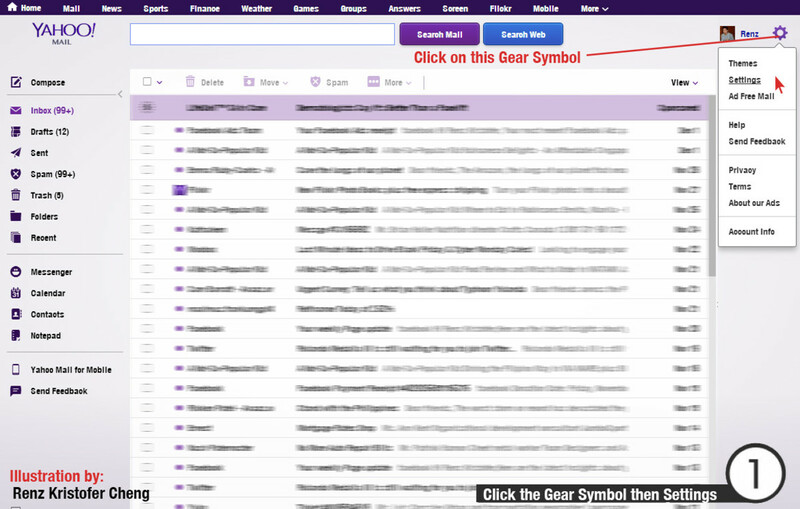 This will show you how you can add images, photos or logos in the signature portion of the new Yahoo Mail. You won't believe how easy it is to do it! Not a Yahoo Mail user? Check out this article for adding photo signature in your Gmail account. By the way, in case you encounter some vague procedures here, feel free to comment on them below. I will be really glad to help you out! Anyway, let's get on it! 1. Aside from being on the Yahoo! Mail page, the first step is to click on Gear Symbol or Options (found on the upper right side of the page). This will make a drop down list appear; just select Settings. 2. 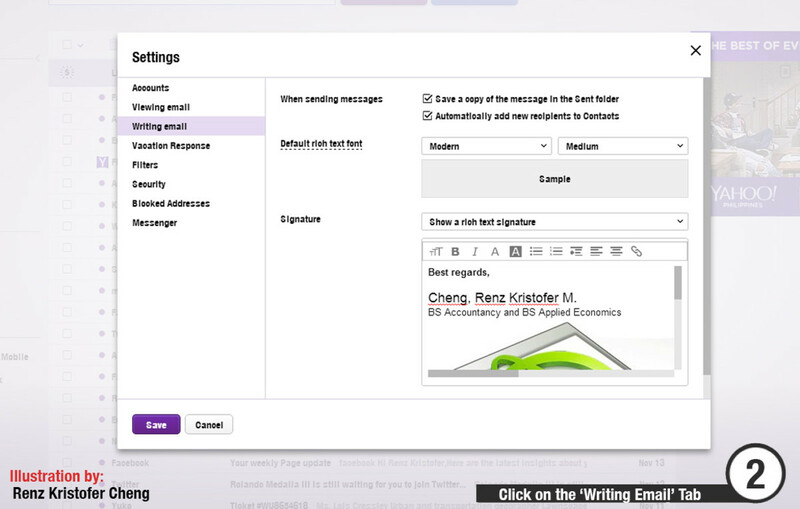 After being directed to the Settings page, select and click on the Writing Email Tab. From there you will now be able to edit your email signature. Go on, write the text portion of your signature! After that, you may proceed with the next step. Oh, make sure that this is selected in the options: "Show a rich text signature". You may check out the photo below to be guided. 3. The next step is to copy the image itself. You may do this by opening a file using any web browsers. (In my case, I used Google Chrome). And then, right click on the picture, and select Copy image. 4. Go back again to the editing space of the Signature tab, and paste the image you copied there. 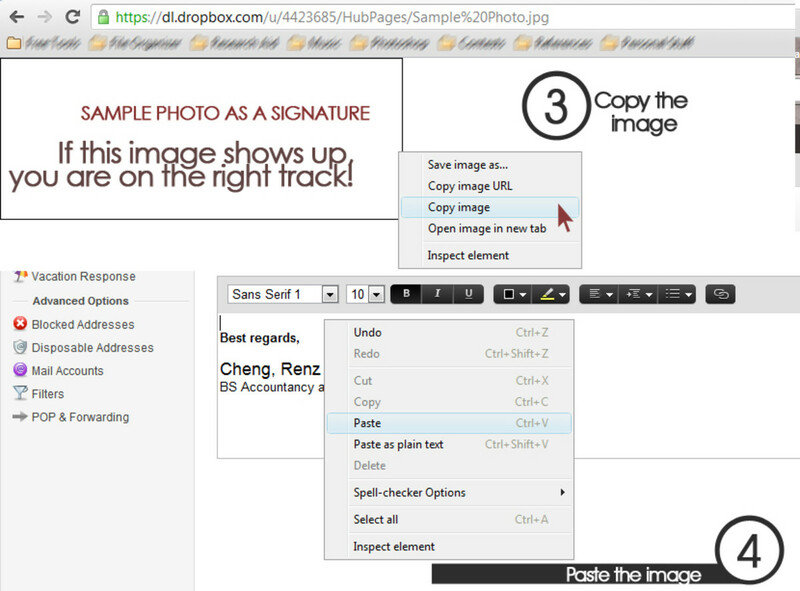 Copy the image itself, and paste it in the editing space in the Signature Tab. 5. Wait for the photo to load up properly. If nothing shows, it may mean that you were not able to copy the image successful (i.e. clipboard is empty). You may go back again to Step 3 if this happens. 6. If everything goes well, the photo will load up fine. Then, the final step is to click on Save, and you're all done! 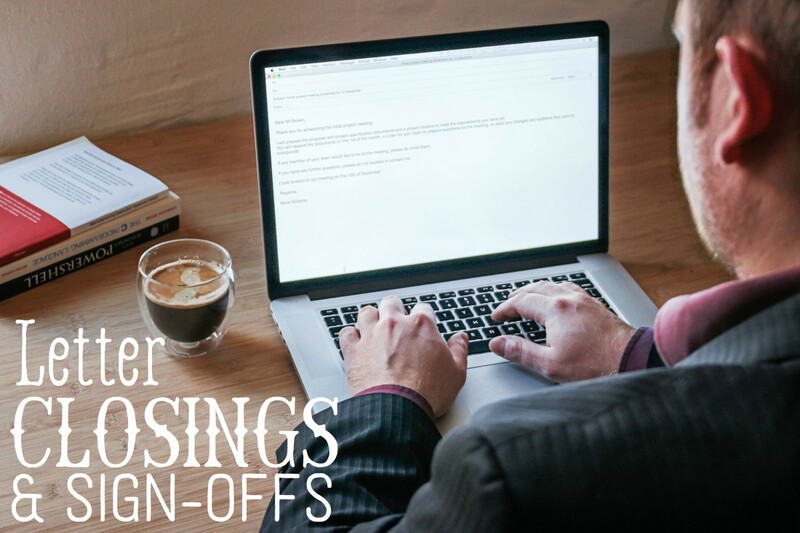 Next time when you compose an email, the signature will automatically be inserted. 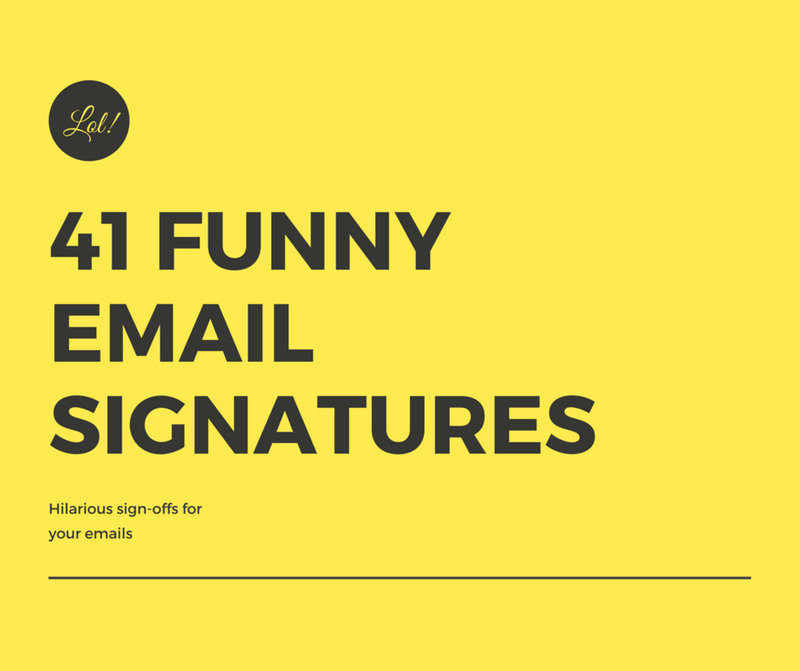 And it means your email will now look more dashing! Anyway, I hope you enjoyed this tutorial! The image should load up correctly, and after that, click on save. You're done! Q: Why are the photos not showing or loading? I'll update this portion, once some common issues arise. 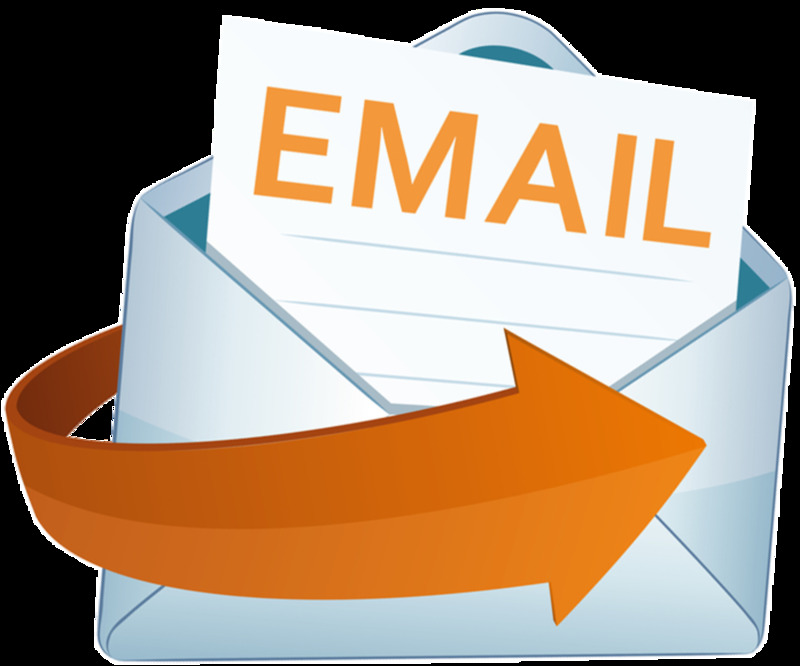 Which is better in providing email services? 4 out of 5 stars from 15 ratings of this article. Using Dropbox to host and embed photos in websites, blogs and email is so simple and easy! 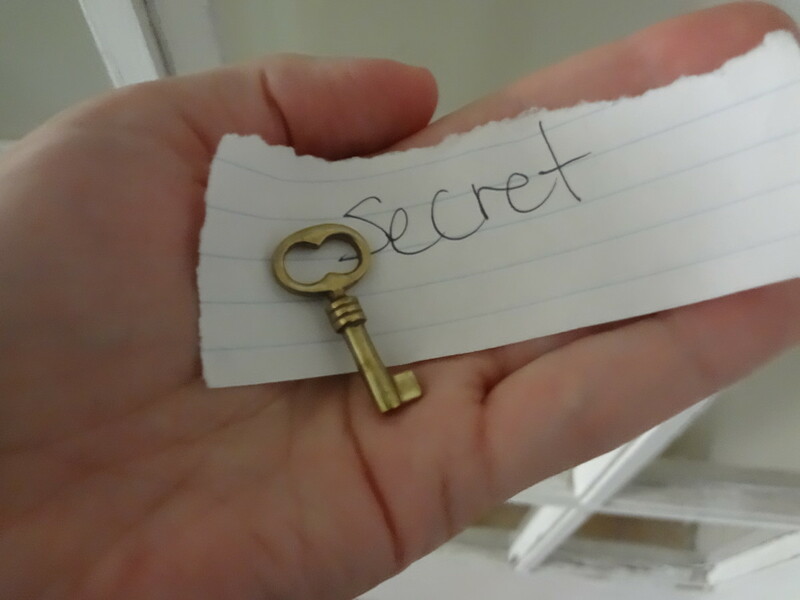 Follow the steps in this friendly article to walk you through the process. Adsense Help: Here's an article that helps you in addressing some of the adsense problems you encounter in your Google Adsense. I have tried inserting a logo in the format of GIF, but the picture does not show, and when I have to create a signature after clicking on settings i have to go to "Accounts" then "Edit detail"(click the email account text box) and even after enabling the "Always show images" the signature image still doesn't display. Please help! Nice post and usefuul and i will to try thanks alot for shering.. It's possible since I was able to have mine. Maybe the FAQ was outdates. Sorry about that. It is not possible to add an image to your email signature. At this time, it is not possible to add an image to your web signature. If you would like to send a picture with an email, you can send the image as an attachment instead. Is this correct? As I see heaps of images in people's signature. Thank you! One possible reason why the image won't show is that the Yahoo mail is blocking it off. Hence, be sure to enable the "Always show images" option. If this does not give the answer, you may be "Copying the image URL" rather than "Copying the image" itself. Hopefully, I was able to hit it with these two suggestions. If not, feel free to message again. Have a nice day Joanne! G'day! I am trying to follow getting an image into my sending email. I downloaded it to Drop Box, added it to the signature, saved it, but still won't work. Any way you can help me? Thank you! @Katai Were you able to select the "Show a rich text signature"? 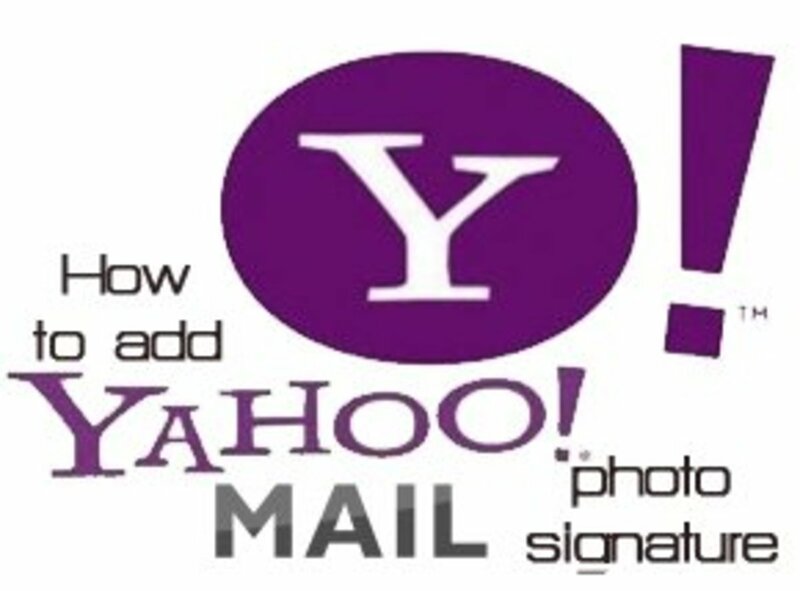 This will permit you to add a photo in your email signature in Yahoo. @Kamila What does the error say? Make sure that the links you copy from Dropbox ends in ".jpg" extension. And note that you will need to put the images in your Public folder. When I try to put in pictures or links to my various review sites, it says that there is an error, that it is too long. Do you know why? Help! ;) Thanks!!! Thanks ossmedia! Yes, adding an image signature is really interesting and may also be fun to add. Glad that you found this a great post! Well i had never tried this one in signature and never think of this. I was stunned to see the post and it seems very interesting. I will definitely use image in signature. Hope this will come in handy vibesites! Tell me if something goes wrong because if the layout changed, I may need to revise some of the details here. Thanks for the comment! @Ed, Hello there! I think you had the same problem with Georgia, but I guess that is just a temporary glitch or something. When I re-do all the process mentioned above, I also don't see the image signature immediately, but it appeared the other day. So, I am also guessing that it now takes time before the image signature becomes visible. @avowhubp Thank you for the kind comment! I'm glad you found this article informative! Oh and welcome to Hubpages too! Hello there. I stumble upon your article and do exactly the same. However, nowadays, Yahoo! Mail doesn't want you to put image on signatures. Is this like their new rule? Or some glitch? Follow up: This morning I checked my Yahoo Mail and tried composing an email. And when the compose message loaded up, I saw my email signature there. So, I think it was a one-day glitch that the image signatures won't load up. Hopefully, you'll be able to see your too! Hello there Georgia! I've tried doing the same thing all over again, and it seems like you are right. I have to find ways in order to have an image signature. I'll just update this article as soon as I find a solution. Unfortunately, it seems that the new Yahoo doesn't allow for pictures in your signature. Before it changed over, I did exactly what you instructed above and it worked perfectly fine. Now, I go through the motions of adding the picture in Signature, it saves perfectly fine. But when I go to compose an email, it's not there. I go back to the Options/Signature and the image is still there. Another blogger said that there must be text, so I try adding some text but now Yahoo is saying that the text is too long (it's not, I only wrote "yours sincerely"). So I delete the text and the signature with the pictures saves just fine but still isn't showing when trying to compose. I read on yet another blogging site that now, the pictures have to be on the web, in a picture saving site. I haven't tried that yet. However my problem is that I want to insert a hyperlink with the picture in my Signature. Will try to see if it will still work with the image saved on the web first. Hello there Paul! I guess Yahoo Mail is automatically blocking photos from outside sources. You may try to enable the "Always show images" option. It shows the pic in the signature section, then I save, go to compose and the pic is not there... just the www. Aww. I guess you have to explore the forgot password option of Yahoo. But I guess you have already tried that out. You may try logging again using another computer, maybe the keyboard there isn't functioning well or the CAPS LOCK was on since you said you did not change your password. Or if you were able to associate another email address to your yahoo mail, then you can retrieve your password through it. Anyway, I hope you can retrieve your account. It really is difficult to experience such.